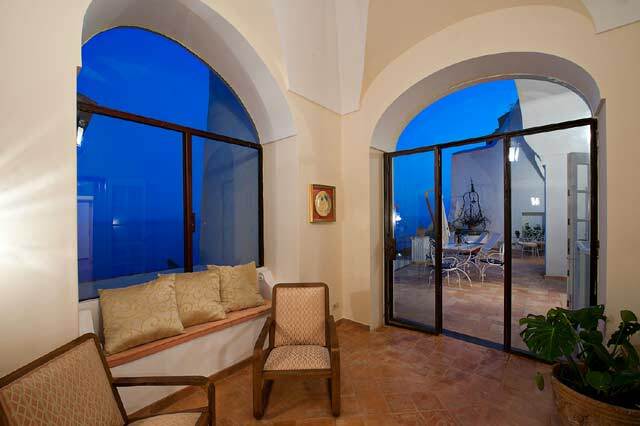 Accommodation: 140 sqm indoor and 40 sqm meters of outdoor area consisting of terrace with wide panoramic views of the sea. Facilities : Air conditioning/heating throughout, Satellite TV, DVD, CD reader, kettle, toaster, five-burner cooker with electric oven, microwave, dishwasher , washing machine, ironing equipment, hair dryers in each bathroom. 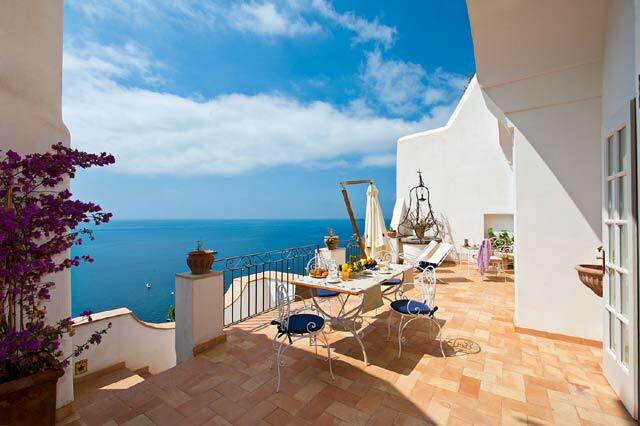 Villa Il Pozzo is part of an old 17th century villa located in a beautiful, panoramic position. 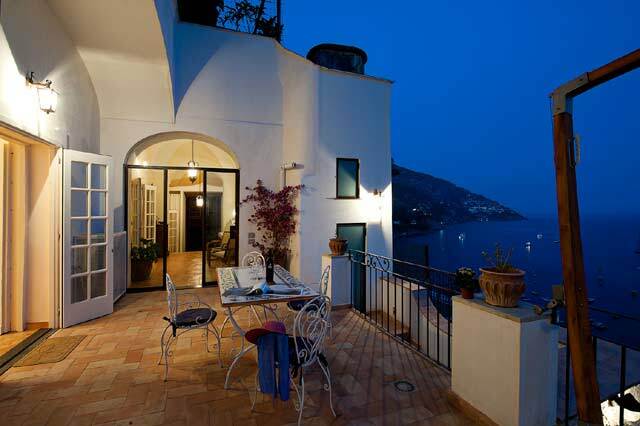 This house is especially attractive for its modern décor, spaciousness and proximity to the lively center of the famed seaside town of Positano. The accommodation benefits also from a large private terrace, which serves as an ideal setting for enchanting meals or sunset cocktails while admiring splendid sea views. 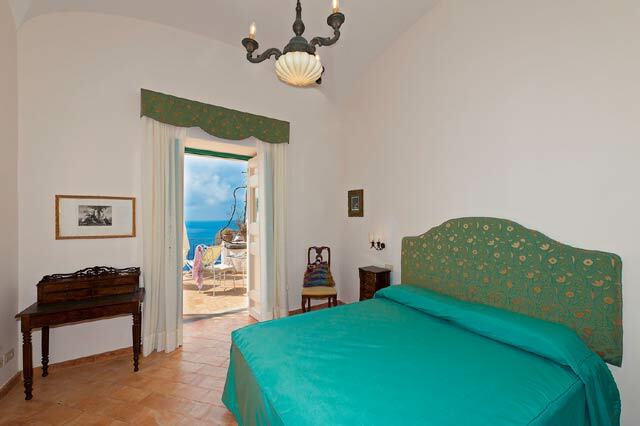 At Villa Il Pozzo guests will fully enjoy the pleasure of a stay into a charming and authentic ancient house of Positano, located in one of the most beautiful spots of the town. 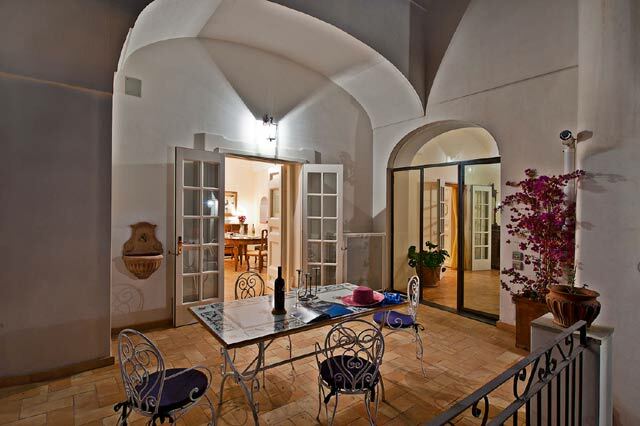 The spacious interiors have high vaulted ceilings and thick stone walls, which is characteristic of the ancient buildings of the Amalfi Coast. The recent renovation made with special care, has transformed it in a very pleasant holiday house offering high level of privacy and a warm and familiar atmosphere. 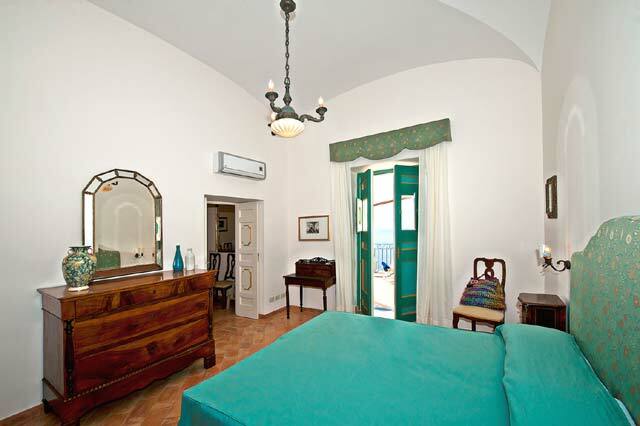 The interiors of Villa Il Pozzo are airy, full of light and immaculate. It has the warm welcome of home: the choice of colours, the floor in antique terracotta tiles, the high vaulted ceilings, the room dimension, the blend of antique pieces and modern design, the high quality drapes and many important ornaments and valuables , create a refined and elegant house and ensure to the guests a surprising pleasure of staying and any kind of comfort. The fittings include all modern conveniences such as satellite TV, washing machine, dishwasher, air conditioning, central heating, etc. The main entrance to the villa is through a beautiful arched old wooden doors which hides an entrance hall with high vaulted ceilings . This hall is divided into two areas, the second area accessed via three steps. The first area is furnished with antiques. and has ancient wooden doors into a library room which is furnished with two red sofas , reading lamps and tables . Via a wooden staircase one can reach a mezzanine , where a twin bedroom has been obtained. The mezzanine is delimited by a wooden railing which permits one to see the area below. Adjacent to the bookcases, three stairs lead to a long corridor which runs at the back of all the other rooms. Starting at the far end of the corridor and adjacent to the library room is a large modern bathroom with a fully enclosed shower, a basin , WC and washing machine. Back to the entrance hall , accessed via 3 steps, there is a sitting area furnished with two armchairs placed in front of a panoramic window , a built in bench with cushions and a piano . From this area, a wide arched glass door opens out onto the terrace while a set of wooden doors leads into a spacious bedroom which features a double bed , antique bedside tables , inbuilt wardrobe, antique chest of drawers, two armchairs and en-suite, spacious bathroom. The bathroom features a fully enclosed large shower, a basin and WC. The terrace lies in front of the main living/dining room and the third bedroom. The terrace is 40 square meters large and has a dining table which can comfortably seat six guests shaded by an a white sun umbrella, two armchairs and comfortable lounging chairs. 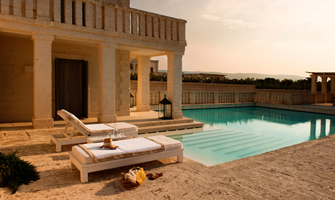 It also offers a wide view of the sea with the three famous Islands of Li Galli in the distance. The terrace is filled with pots of colourful geraniums , red climbing bougainvillea and ornamental trees. The living/dining area is furnished to a high standard, and equipped with a 3 seated sofa, two armchairs, a dining table seating up to six guests, an antique fireplace, a flat screen TV with CD and DVD player. 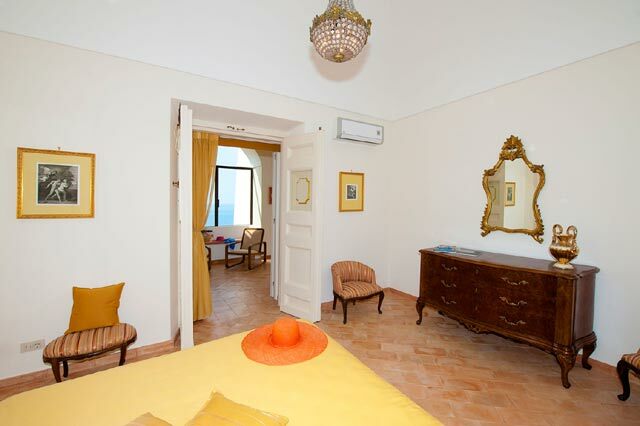 The ceiling is very high and the room is light, due to the large French door overlooking the terrace and the sea. The modern kitchen is small but well organised and equipped with fridge, freezer, five gas range with electric oven, dishwasher, electric kettle , microwave oven, toaster, Italian style coffee maker etc. The third bedroom, accessed either from the terrace or from the sitting/dining room , features a double bed , antique bedside tables , a solid wood wardrobe, antique chest of drawers, and en-suite bathroom. The bathroom is spacious and features a fully enclosed large shower, a basin and WC. Each room has heating/air conditioning which can be regulated independently. 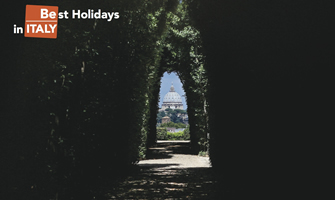 Access: In order to reach the villa from the main street of Positano, you will have to take a pedestrian street which consists of about 70 steps. Centrally located, the closest fruit and groceries stores, as well as several cafes and restaurants are at the bottom of the steps that lead to the villa. The closest beach is the main beach of Positano, called Spiaggia Grande. It can only be reached on foot in 5/6 minutes by following a charming downhill alley closed to traffic, which will take you to the beach in approximately 600 meters. This alley is full of colourful shops and boutiques, where guests will be able to shop for fashion and local hand-made goods. Ferries and hydrofoils to Capri (30 min), Naples (50 min), Amalfi (30 min) and Salerno (1½h) leave from a pier to the right of the main beach. The other villages of the coast are easily reached by blue buses marked SITA. The nearest SITA bus stop is at about 10/15 minutes walking but can be reached also by local shuttle bus which runs every 15/30 minutes . Ravello 22 kms, Pompei 45 kms. 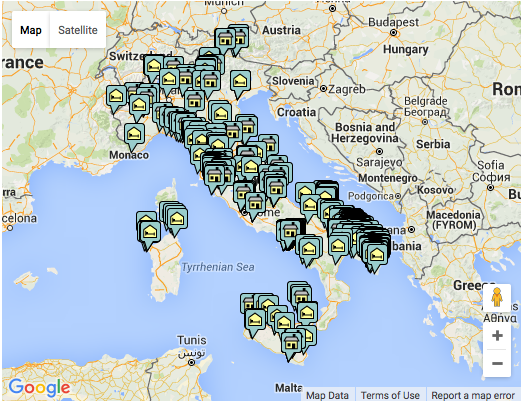 Naples 60 km, Rome (Fiumicino) 267 Km.